Brother Jesse Blog: How To Send Racist Emails 101 : No Easter Egg Hunt at the White House? How To Send Racist Emails 101 : No Easter Egg Hunt at the White House? First there is a homicide on a monkey in the NY Post, now there is a field of watermelon growing in the front lawn of the White House? This week's lesson in how to send a racist email comes courtesy of White Mayor Dean Grose of Los Alamitos, California. 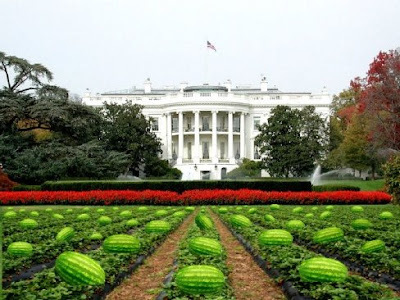 According to news reports, Grose sent out an email that depicts the White House lawn covered with watermelons, under the title "No Easter egg hunt this year. "A Black city worker Keyanus Price was one of those that received the email from him and told AP, "I was horrified when I read that e-mail. What I'm concerned about is how can this person send an e-mail out like this and think it is OK? He's putting the city into a bad place, and he is a liability." According to AP, Mayor Grose said he was unaware of the racial stereotype that Black people like watermelons. How can you be ~unaware of that? What other purpose does that picture serve? "Haha watermelons are hilar!" No. Crazy! He knew what he was doing. I think racism is alive & well in the USA. For him to say he didn't know that is a direct insult to my intelligence. He knew exactly what he was doing and should be forced to resign. But then, where in the world is Los Alamitos and how many blacks live there?? HE was well aware of what he was doing...white folks got some nerve.